Mariusz Skonieczny is the founder and president of Classic Value Investors, LLC, an investment management company. He is also the author of “Why Are We So Clueless about the Stock Market?” To find out about submitting a guest post to Military Money Might, check out our guest posting guidelines. If your broker or financial advisor preaches wide diversification, he or she is saying, “I don’t know what I am doing and therefore, I advise that you invest your money into 100 positions (or invest in mutual funds that hold 100 positions) to protect you against my lack of knowledge.” It makes sense if you really think it about. Let’s imagine that you want to get into the investment industry. You apply for a job with a big name investment firm that is supposed to provide you with investment training. After you land your position, you realize that all you are learning is how to be a good salesman. So when you get a client with $100,000 to invest, will you advise him or her to invest in 10 stocks that you personally selected? 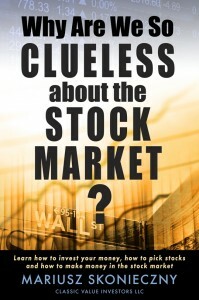 Of course not, because you have no clue how to pick stocks. And even if you did, you wouldn’t have the time because your entire day consists of cold-calling and meeting new prospective clients. Your job is not to invest but to gather assets under management. So instead, you simply advise the client to buy many positions because if one of them blows up, it will not have a huge effect on your client’s portfolio. However, if one of them does really well, it will not have a huge positive effect either. There is a huge difference between putting all your eggs in one basket and being over-diversified. What most people understand clearly is that it is not wise to put 100% of your money into one position because if something unexpected, such as fraud, occurs then all of the capital can get wiped out. What most people don’t understand is that owning 100 positions in a portfolio or through a mutual fund reduces your chances of earning favorable returns. If you want mediocre returns, you don’t need to pay anyone to do it. Paying someone a commission or fee to put you into such an over-diversified portfolio does not make any sense. You can invest in 100 positions yourself without any help. However, when you pay someone a fee, then you should expect the person to know something about investing instead of selling you a fantasy, which Wall Street is known to do. You wouldn’t get a haircut from someone who never cut hair and you shouldn’t invest your hard-earned money with someone who has sales skills in place of investing skills. Next time someone preaches wide diversification, ask yourself if it is to protect you or them. I usually think your posts are very insightful, but I think this one is a bit reckless. I get your point, the potential returns of a less diversified portfolio could outperform a more diversified portfolio. Two problems with your argument. 1. The standard deviation of such an undiversified portfolio, though, would be very high, even if it was diversified among relatively diverse assets. For long term goals, such as retirement or college, why take that amount of risk if it is unnecessary? If a person has maxed out saving for those goals, then focusing on a less diversified side portfolio would be fine, but how many people, especially in the military, max out these accounts to begin with. 2. I think a “financial advisor” is much more than a good stock picker, if even such a thing exists any more. A financial advisor should advise on any number of issues such as taxes, debt management, long term planning, investing, and many other financial issues. A good financial planner won’t advise you to gamble with money you might have to live off of in the future. You are talking about getting rich, which is different than attaining and maintaining wealth, which is what financial advisors do. Previous post: How Close Are You To The Financial Edge?